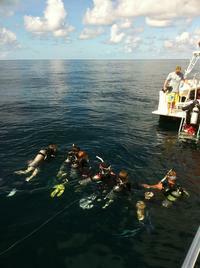 Introductory scuba diving adventure is a fun-filled family-friendly event. The duration is 3 hours for this event. Guests get to have a close encounter with the native marine life. There is a choice to leave in the morning or afternoon. Guests will get an introductory scuba diving lesson. In this 3 hour event, guests will get up-close-and-personal with the introductory scuba diving adventure. The tour is for small groups. There will be a two-to-one ratio. There will be one instructor for two students. The instructors will go over all of the necessary safety features when scuba diving. Guests with more than two persons in their party will be split up into two groups of two. The introductory scuba diving adventure has a choice to leave in the morning or afternoon. All necessary equipment is in the cost of the package. Guests get to have a close encounter with the wildlife. It is a family-friendly adventure. The duration is about 3 hours. Guests will have a small group ratio to ensure a more personalized experience. In the cost of the introductory scuba diving adventure is the use of all the equipment, the instructor, and local taxes. Not in the price of the ticket for the initial to scuba diving adventure are gratuities and hotel pick-up and drop-off. Tips are optional and encouraged. Guests will have a small ratio of 2 to 1, student and instructor. Introductory scuba diving adventures is a fun-filled family-friendly event. Guests will get you to use all the equipment. There is a choice of morning or afternoon departure. Guests will get close and personal with the wildlife. The instructor will be the guide for this tour. Guests are sure to enjoy this experience. Your introduction to scuba diving begins at the dive shop located right on the East end of Panama City Beach. After a brief classroom introduction to the science of diving and functional aspects of the scuba gear you will then be fitted for all the necessary gear. Then you will go to St&period; Andrew's State Park located just 1-mile (1.6 km) down the street for the in-water training and tour. At the park, you will meet your instructor who will unload and prepare the gear. They will then go over the wildlife and conditions of the water to help orient you with the marine environment. Next you'll enter the water and briefly practice the basic skills of scuba diving and then begin the tour. If the group is more than four (4) people it will be broken into two (2) groups to provide a small instructor to student ratio while on scuba. The participants not on scuba will be free to go snorkeling and explore the area from the surface until its their turn. The tour will last between 30-45 minutes. Please note: transport to the park is not always available, please be prepared to make your own way there after check-in.